there are gameboy original mods for backlighting. pretty cool. Its never been played. No scratching on the pins or cart housing. Mint condition with all the manuals. Where the **** are you getting these from? Collectors? Im happy though. Glad that I waited for the Flame Red and the price drop. Just coming back from the city center I got 22 street passes! 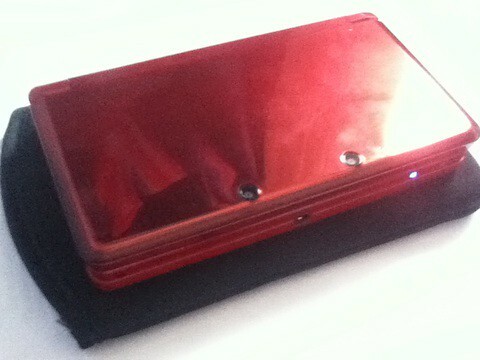 Flame Red 3DS looks badass! The counterfeit Pokemon games... something about them makes me want to own them anyway, as long as I could get them cheap. Maybe just for the novelty factor? I suppose it's a bit like my Dad collecting bootleg Beatles records as well as the legit ones, they're still kind of interesting for collectors and fans! Very cool! Some of the limited edition handhelds are so awesome! I wants! But I want even more the Famicom version of that SP, with the Japanese colouring! How's your collection coming along Chase? Nothing new yet, but has found its home for the time being (Ignore writing, was for the gaming set up thread). Does anyone have a GBA Micro they'd be keen on selling? Looks so so cool Malkav, great work! Does anyone have a GBA copy of Metroid Zero Mission they would be willing to sell me? Cheers.